Schwab Intelligent Portfolios is a solid robo-advisor with a relatively low balance requirement and no account management fee. The Bottom Line: Intelligent Portfolios is an ideal robo-advisor, thanks to its $0 management fee and low-cost ETFs. Charles Schwab has the investing space covered. At one end of the spectrum is Schwab's online brokerage for the DIY investor. At the other end, its advisory service combines automated portfolio management with unlimited access to certified financial planners (for a $25,000 minimum balance). Nestled in-between is Schwab Intelligent Portfolios, offering automated investing management and personal finance guidance (with financial advisors rather than CFPs) at a lower $5,000 minimum balance requirement. Notable for Schwab's robo-advisor offering is its $0 account management fee, comparably lower to what most of the competition charges: 0.25% of assets under management or higher. But in exchange for free management, investors must be comfortable with a portfolio that has a fairly high allocation in cash, which means a chunk of a customer's account remains uninvested at all times. In addition, investors looking for a highly customizable offering may be underwhelmed. Free management: Schwab charges no management fees, commissions or account fees on Intelligent Portfolios accounts. This isn't exactly a case of charity, because customers still pay the expense ratios on the investments used and many of those are Schwab funds. But even factoring those in, the service is a value. The "aggressive" portfolio is slightly more expensive than with many other robo-advisors — but Schwab compares favorably when considering the overall fee picture. Other providers charge a management fee (which Schwab doesn't) in addition to the fees from those expense ratios. Investment scope: Schwab handily delivers on the diversification promise. It draws from 53 exchange-traded funds, or ETFs, which enables it to offer exposure to over 20 asset classes. Schwab Intelligent Portfolios supports both taxable and retirement accounts, which sets it apart from others. Customers may also roll over a 401(k) or IRA to the robo-advisor. Ability to customize: Like other automatic advisory services, Schwab cooks up a customized portfolio based on the answers to questions that get at an investor’s goals, time horizon and risk profile. Investors can tweak the allocation in Schwab's recommended model by picking as many as three ETFs to remove and replace with an alternative investment of Schwab’s choosing. For example, if you don’t like the foreign-market ETF chosen for your portfolio, Schwab’s feature lets you punt it from your portfolio, in favor of another from the list. Customers can have as many as 10 different types of Intelligent Portfolios accounts (so long as there's $5,000 in all accounts combined), customizing each with a different goal and strategies. Goal tracking: Speaking of goals, saving for a far-off, high-dollar goal requires discipline and patience. While progress can be slow, it’s nice to be able to track it. Schwab Intelligent Portfolios’ Goal Tracker feature provides a daily snapshot of how your portfolio is tracking against a savings or income goal. On target, which Schwab defines as having a better than 50% chance of reaching your savings goal. At risk, between a 25% and 50% chance of reaching your goal. Off target, less than a 25% chance of hitting your goal. It then suggests adjustments that could improve your likelihood of long-term success, such as increasing monthly contributions, making a one-time contribution or adjusting your risk profile. Goal Tracker is a particularly valuable monitoring tool for investors who are past the wealth-building stage and are — or will soon be — drawing income from their investments, something that has huge short- and long-term lifestyle consequences. 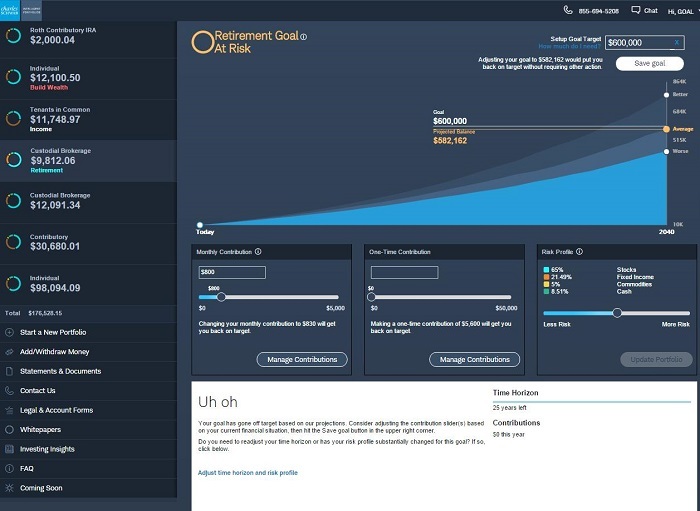 Goal Tracker monitors how your withdrawal targets are affecting future income-stream projections, so you can make quick adjustments to have a better chance of achieving a happily-ever-after retirement. Large cash position in portfolios. The biggest criticism of Schwab Intelligent Portfolios’ strategy is that it allocates a good percentage of money to cash — a minimum of 6% all the way up to nearly 30% of total portfolio holdings, the latter of which makes sense for those at the conservative end of the risk spectrum. According to Schwab, most Intelligent Portfolios clients hold from 6% to 10% in cash. But even that may even be too cash-heavy for some investors. For a 30-year-old aggressive investor saving for retirement, the cash position Schwab recommends is 6.9%. The recommended allocation is 10.5% cash for a 40-year-old father with 3-year-old twins and an above-average tolerance for market fluctuations. Sitting on do-nothing cash may be good for investors who aren't disciplined about deploying their cash reserves, especially when the market is in a down cycle. But those who have other plans for their cash and who desire a completely invested portfolio service may be turned off by this unavoidable cash allocation. What's more, the annual percentage yield Schwab currently pays on cash allocations is lower than you would get in a savings (or money market account) at many banks or credit unions. Limited tax-loss strategy. Tax-loss harvesting is one of the selling points of having a robo-advisor manage your portfolio. It’s a complicated task of selling loser investments in a taxable account to offset taxes on any gains. It's particularly valuable for investors in the higher income tax brackets. The service is only available to clients who opt into the feature and have a minimum of $50,000 in their taxable account. Keep that in mind if it's a must-have feature on your wish list. Portfolio mix. There's no denying Schwab's list of ETFs for constructing portfolios is impressive — and more comprehensive than other robo-advisors. Problem is, that list won't impress people looking for socially responsible investing options, for example. Is Schwab Intelligent Portfolios right for you? Schwab Intelligent Portfolios has all the characteristics of an ideal robo-advisor: The company has a strong reputation, it has some of the lowest-cost ETFs on the market (its own) and offers all this with an ongoing $0 management fee. Combined, these features make for a pretty powerful long-term wealth-building selling point. We’re not fans of the high cash allocation, especially for younger investors. And we would like to see tax-loss harvesting made available for any customers with taxable accounts. Finally, customers looking for more individualized customization may be disappointed. But Schwab is a solid choice for savers taking their first foray into robo-advisor managed accounts.